Got some plates for the Baja Saab project. I generally wouldn’t bother getting vintage plates for a vintage car, but, 1968 Texas plates commemorate the San Antonio World’s Far, Hemisfair, which makes them cool enough to go through the bother of getting/registering. 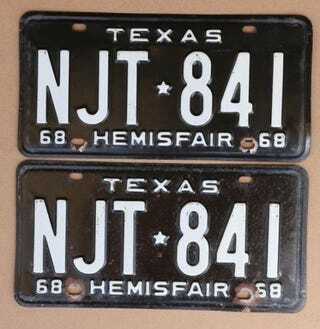 Interestingly, I never noticed before that Texas plates used to alternate designs every year - even years were black with white numbers, odd years were white with black numbers.